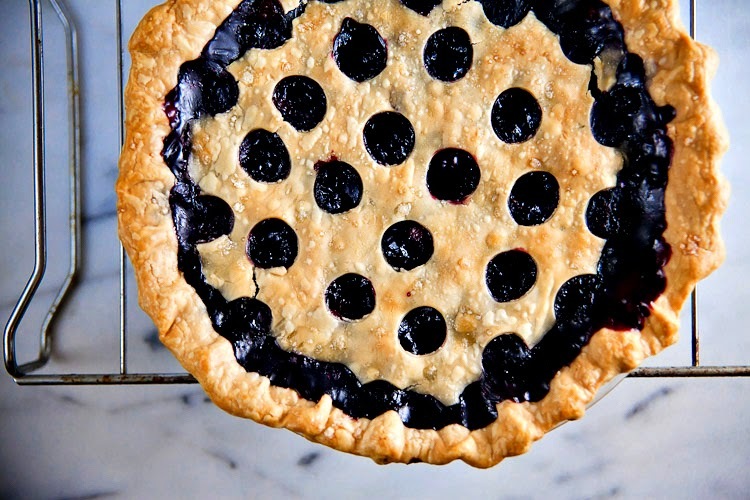 This triple berry pie is inspired by the best ingredients summer has to offer – from three kinds of berries to an amazing a lemon and coconut oil infused crust. Cooking the filling on the stove instead of putting raw berries right into the crust eliminates that annoying air gap pies can get sometimes. It also lets you adjust the amount of sugar to taste – feel free to start with 1/4 cup and add the rest only if you need it. In a large bowl mix together the flour, sugar, lemon zest, and salt. Add coconut oil; use your hands to mix the evenly distribute the oil into the flour. Sprinkle ice water over the flour; gently mix until the dough starts to come together. Form dough into two balls; flatten each ball into 4-inch wide disk. Wrap separately in plastic wrap until ready to roll out. To make the filling, add the berries and sugar to a large saucepan. Cook, stirring frequently, until the berries soften, about 5 minutes. Stir in the cornstarch and bring to a boil. Cook 2-3 minutes or until the mixture thickens. Let cool. Working on a generously floured surface, roll one disk of dough into a 13-inch circle. Transfer to a 9-inch pie pan. Fill with the berry filling. Roll out the other disk. Use a small cookie cutter or the wide end of a pastry tip to cut a design into the crust. Carefully place on top of the pie filing. Roll the edge of the top crust underneath the edge of the bottom crust. Use your fingers to crimp the two crusts together, forming a seal. Brush top top crust with coconut milk and sprinkle with turbinado sugar. Bake at 450°F for 15 minutes. Reduce heat to 350°F and bake for 1 hour. Transfer the pie to a cooling rack. Let cool completely (at least 2 hours) before serving. It's Halloween and the Undead are Rising! Have You Heard of Kluski? Want your own copy of Make Ahead Bread?